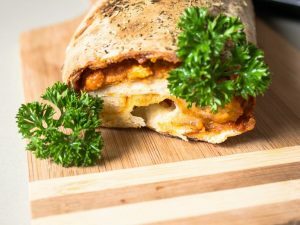 This dish of pepperoni pizza bombs is the easiest and very fancy looking snack that can be enjoyed at any kind of party, social gathering or just a fun evening meal. 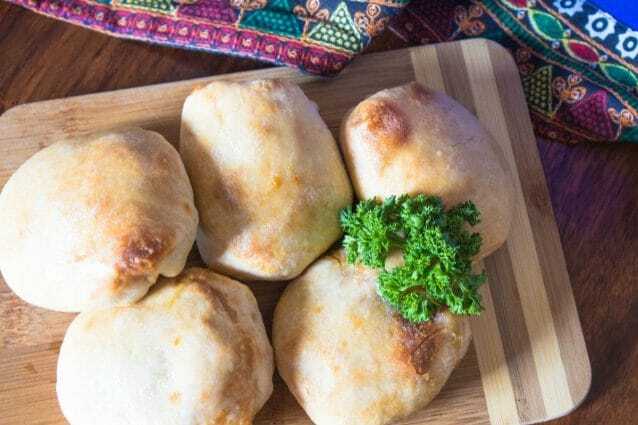 I love these mini pizza bombs so much that I made a huge batch of it and enjoyed them for good two days. In fact, I went a little overboard and packed these for my kid’s school tiffin and ever since then I am being pestered to pack it every day! Preheat oven to 200 degrees C and line a baking tray with aluminum foil. Lightly grease the foil evenly with olive oil. Lightly knead the pizza dough and separate it in to 8 small balls of equal size. Sprinkle the flour lightly on a clean rolling surface and roll each ball individually in to small circles or about a ¼ inch thickness. It need not be a perfect circle. Evenly spread the pizza sauce over all the 8 rolled circles. 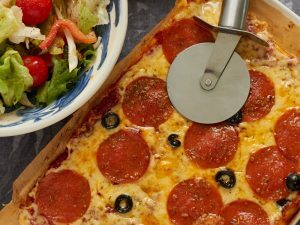 Place two pepperoni slices over each rolled circle so that the slices are placed almost at the center of the dough. Cut the mozzarella cheese evenly into 8 cubes and place 1 cheese cube over each rolled circle. Now pull the dough from the edges around the contents in to a small pouch or a small money bag and then twist and pinch the top knot in to the center of the ball so that you make a small ball so that you turn it in to a small ball which sealed from all sides. Place the pizza dough seam down over the lined baking tray a few inches apart from each other. Lightly brush pizza bombs evenly with a half teaspoon olive oil. Transfer the baking dish in to the preheated oven and bake the pizza bombs for about 10 minutes or until it turns golden brown from top. Remove the hot bombs and lightly brush them evenly with melted butter and serve hot! Make sure that the pizza dough is at room temperature else it will be difficult for you to roll it. It is fine if the tied pizza ball has a small opening at few points. Just pull the dough together to seal those points before you place them on the lined baking tray. It is recommended that you seal the bombs really well before you pop them in the oven or else you will have cheese lave oozing out. 4 ideas for a tasty dinner party!